PayTM First Membership – Hello wap5 Readers! Here i am back with a Latest News Directly from PayTM HQ for All of Us. PayTM has Launched PayTM First Membership Yesterday. This is the most awaited by the Indians and Mostly by the PayTM Users. We all know that PayTM is spreading good Deals and Cashback Offers Now a Days and Once Again to Survive in Market Across Free Amazon Prime Membership and Free Flipkart Plus Membership, PayTM is Back with PayTM First Subscription. Here i will Give you Full Details of PayTM First Offer. We all Know that Now a days Online TV, Deals, Live Streaming, Series are Trending on Many Apps and this Trends are All Because of Netflix, Amazon Prime Video, ZEE5 and Many Other Leading Brands in Indian Market. But Yesterday, PayTM is Back Again with PayTM First Premium Subscription for Their Users. Read Full Post Below and Get How To Get Free PayTM First Subscription? What is PayTM First Premium? and Many Other Answers Below. PayTM First is a premium subscription-based rewards & loyalty program for our users. With this, they are offering exclusive benefits, over and above our regular offers. Say Hello To The GOOD LIFE is Punch Line of PayTM First Premium. 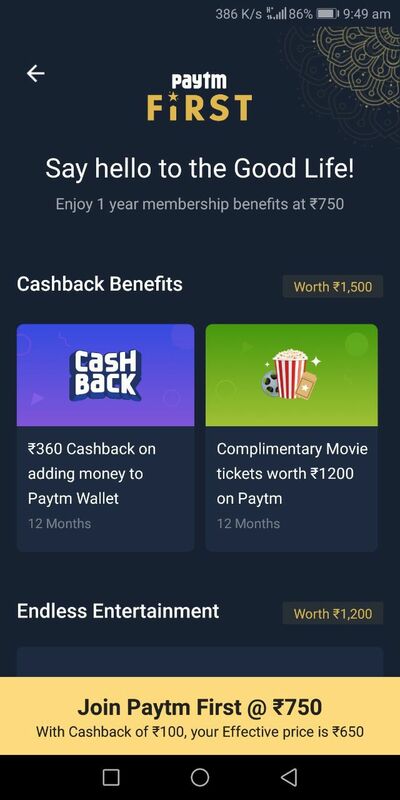 Using PayTM First, User will Get Exciting Memberships, Awesome PayTM Deals, PayTM Cashback, PayTM Loyalty Points, Priority On Deals, Premium Musics and Movies and Many More Extreme Level Services. Paytm First customers will enjoy a wide range of exclusive benefits from leading partnered brands for the entire year. PayTM First Customer will Get Benefits worth Rs. 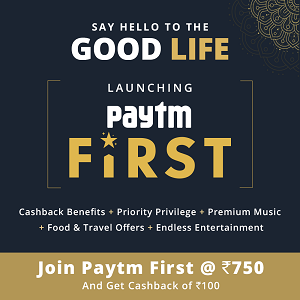 12000 When they will Purchase PayTM First Membership and Many More Benefits Like, Cashback Benefits, Priority Privilege, Premium Music, Travel & Food Offers, Endless Entertainments and Below Offers. 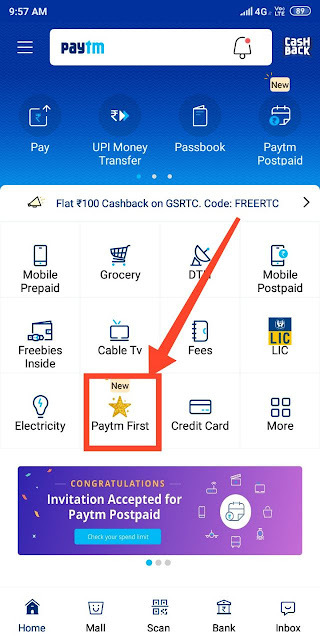 PayTM First is available in beta on Android (join beta program from Play Store to get Early Access) and It is Already Launched on Android Play Store On 5th March. means Yesterday. It should be available on iOS by 6th March Officially. PayTM is available at Just only Rs.750 Per Year For Every User. This Price is Very Cheap in Comparison with any Other Premium Memberships. Additionally, User will get Benefits upto Rs.12000 which is Very Good for the PayTM users. 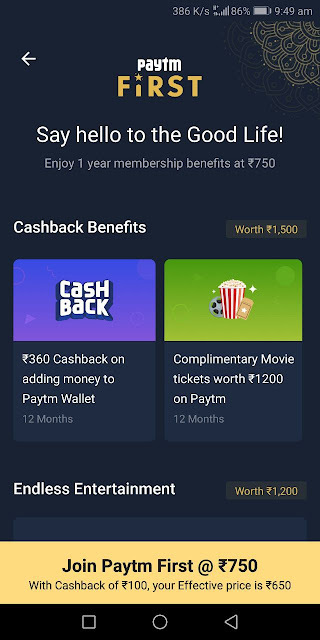 User will Get Rs.100 Cashback in PayTM Wallet After Purchasing PayTM First Subscription. So Final Price of PayTM First Membership is Just Rs.650.